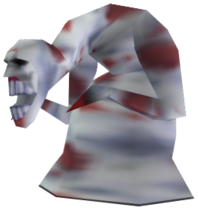 The Dead Hand is a Mini Boss from the Legend of Zelda: Ocarina of Time (1998) that battles Link at the Bottom of the Well in Kakariko Village and also in the Shadow Temple in the Graveyard, there is another Dead Hand in Ganon’s Castle during the Masterquest. 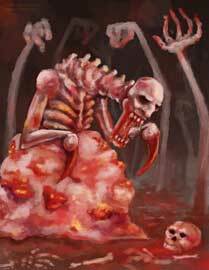 Dead Hand is probably one of the scariest enemies in the Legend of Zelda games and was drawn by more artists for our Link’s Blacklist art collaboration than any other boss beside from Ganon so far. 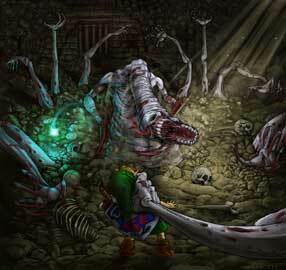 There are sadly no official artworks of this monster. 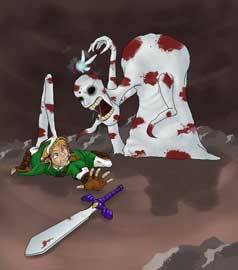 Dead Hand is a part of Link’s Blacklist since we started it back in Summer 2012. Since than we always had at least one submission for this scary monster.